Gastroesophageal Reflux Disease (GERD) or Acid Reflux occurs when stomach ‘acid’ refluxes into the esophagus. It is the ‘acid’ burning the esophagus that causes the symptoms. Common symptoms are heartburn, often described as a burning pain in the upper abdominal area, mid-abdomen, or lower chest that radiates upwards and into the throat or neck area. Everyone is different; it is not always ‘burning’ pain but sometimes is sharp or pressure-like. On occasion the symptoms are confused with ‘heart pains’; at times what seems like heart symptoms can be due to Acid Reflux. Some individuals do not experience much ‘burning’ but experience regurgitation symptoms. These people sense that actual stomach contents are coming up and into their throat or mouth. Other symptoms can include ‘water brash’, the mouth filling quickly with saliva or pain felt when swallowing. Some individuals have extra-esophageal manifestations (symptoms outside of the esophagus). Occasionally such individuals have problems with coughing or what seems to be asthma related to the acid reflux. Other individuals have a sore throat or hoarse voice. If an individual has problems swallowing solids, this is considered an alarm symptom as it can sometimes indicate the development of a narrowing in the esophagus due to scarring or even cancer of the esophagus. If this is the case, see your family doctor immediately. Why Does Acid Reflux into the Esophagus? 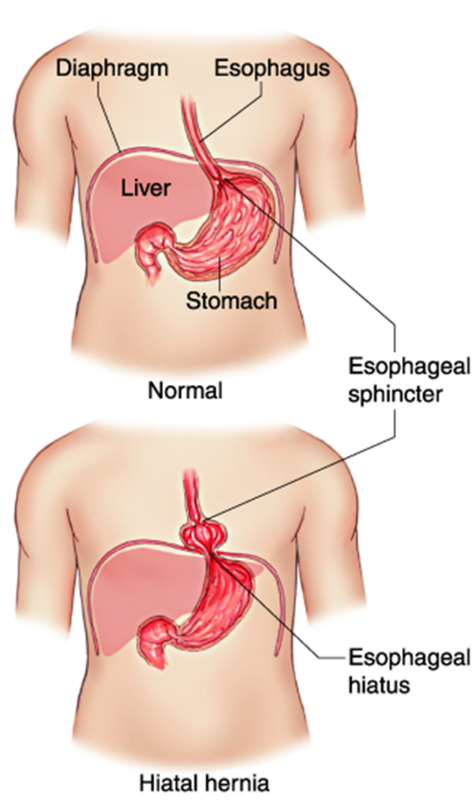 Typically, stomach acid does not reflux into the esophagus because there is a sphincter or muscle at the junction of the esophagus and stomach which is tight, and prevents stomach acid from going into the esophagus. In individuals with acid reflux, it occurs due to a weak sphincter or, more often, when the Lower Esophageal Sphincter (LES) is relaxing at times that it shouldn’t, allowing the acid to reflux into the esophagus. ‘Hiatus hernia’ and ‘acid reflux’ are terms that are used interchangeably but to do so is not entirely accurate. What is a hiatus hernia? The diaphragm is a large flat muscle at the base of the lungs that contracts and relaxes as a person breathes in and out. The esophagus passes through an opening in the diaphragm called the diaphragmatic hiatus before joining onto the stomach. If there is a weakening in the diaphragm muscle at the hiatus, the stomach may be able to partially slip through the diaphragm into the chest, forming a hiatus hernia. While the presence of a hiatus hernia makes acid reflux more likely, it is not thought to be the major cause of acid reflux. As mentioned above, malfunction of the Lower Esophageal Sphincter is believed to be the most important factor in most individuals. Hiatus hernias are quite common; 50% of individuals will have a hiatus hernia by age 50. Therefore many individuals with a hiatus hernia have no reflux symptoms, and many with acid reflux do not have a hiatus hernia. Does the Severity of the Symptoms Correlate with the Amount of Acid that is Refluxing? The short answer is no. Studies have shown that in some individuals with mild symptoms the amount of acid refluxing into the esophagus is significant, while in some individuals with severe symptoms there is only a mild amount of acid refluxing into the esophagus. There are even some individuals with ‘Silent Reflux’; these individuals will deny any heartburn or regurgitation, but will see their doctor about other problems related to acid reflux, such as problems swallowing or a hoarse voice. How Is the Diagnosis of Acid Reflux Made? Patient history is significant in most cases; it, in conjunction with an upper endoscopy (also known as a gastroscopy) helps to confirm the diagnosis as well as rule out other causes. In some individuals with atypical symptoms or symptoms that do not respond to the typical medications, a test called a 24-Hour Esophageal pH Study can be performed. This is a test during which a small tube is inserted through the nose and into the esophagus; it is connected to a data recorder the size of a Wallet that is connected to the patient’s belt or pants. It remains in the esophagus for 24 hours while data indicating whether acid is refluxing is recorded. During this time, the patient keeps a diary of symptoms. Sometimes a test called Esophageal Manometry is performed. This involves placing a small tube through the nose and into the esophagus to measure the muscle contractions of the esophagus and help determine if the muscle or sphincter in the lower esophagus is functioning properly. This test is usually reserved for patients for whom the diagnosis is unclear after other tests or when surgery is being considered. In individuals with mild acid reflux symptoms, treatments recommended are lifestyle modifications and antacids. Lifestyle modifications include avoiding foods that exacerbate symptoms, such as caffeine, chocolate, alcohol, peppermint and fatty foods. Quitting smoking will also help. Avoiding lying down with a full stomach and not having large or late meals also helps. Antacids will often temporarily decrease symptoms. Although not as convenient as antacid tablets, liquid antacids tend to coat better. Weight loss can also help. In individuals with symptoms that cause waking up at night, raising the head of the bed 6 to 8 inches often will help. This can be done by either putting bricks or blocks of wood under the legs at the head of the bed, or foam wedges under mattresses. Some manufacturers have developed commercial products for this purpose. It is important to note that often using pillows alone can make things worse, as this causes the body to bend and actually increases abdominal pressure, causing more reflux. In individuals where antacids and lifestyle measures alone do not control things, often medications are begun. In most individuals this is a chronic problem and they need to be on medication regularly to control symptoms. It is not unlike having high blood pressure, when on the medication, their blood pressure is controlled. If the individual stops the medication, their blood pressure goes up again. In individuals with acid reflux, while they are on the medication their acid is controlled and symptoms are improved. When they stop the medication, their acid is not well controlled and their symptoms return. Moderate Symptoms - In individuals with moderate symptoms, usually histamine antagonists are used. In Canada, ranitidine ( Zantac®), Famotidine (Pepcid®), Cimetidine (Tagamet®), and Nizatidine (Axid®) are used. In most individuals, symptoms are better controlled by taking these medications twice a day. These medications work by decreasing stomach acid production. By decreasing acid production, when stomach contents reflux into the esophagus, they are less acidic and cause fewer symptoms. Severe Symptoms - In individuals with more severe symptoms or who have complications such an esophageal stricture, stronger medications are usually required. Proton pump inhibitors in Canada include Omeprazole (Losec®), Esomeprazole (Nexium®), Lansoprazole (Prevacid®), Dexlansoprazole (Dexilant®), Pantoprazole (Pantoloc®), Rabeprazole (Pariet®, and Tecta®). These medications are potent acid suppressing medications. Decreasing stomach acid means that there will be fewer symptoms when stomach contents do reflux into the esophagus. If an individual is taking this medication once a day the best time to take it is in the morning before breakfast. In individuals for whom one tablet alone does not control symptoms and two tablets a day are needed, it is best to take the medication before breakfast and before supper. This family of medication has been around for over 20 years and are in general as safe as any other medication out there. About 2% of individuals will develop headaches or diarrhea which resolves with discontinuing the medication. 1. Vitamin B12 deficiency, most individuals have enough vitamin B12 in their diet that this is not an issue. This said, in elderly institutionalized individuals who are on PPI’s chronically this could be an issue and should be checked for. 2. Pneumonia, there may be a slight increased incidence of pneumonia but this is quite controversial, the data is conflicting (some analysis suggest there may be a slight increase risk others not). No definite recommendations can be made. 3. Clostridium difficle infections, there is an increased risk; recommendations are that we need to be careful in hospitalized patients receiving antibiotics. 4. Plavix/Clopidogrel, although the FDA in 2009 issued a warning regarding increased risk of heart problems in patients on PPI’s and Plavix this was based on weak data. Recent more robust data has showed that the increased risk of adverse heart issues was 0%. 5. Increased Incidence of Osteoporosis, although somewhat controversial. In general this is not thought to be an important issue, with most people with osteoporosis on a PPI having other risk factors for osteoporosis. Calcium carbonate tablets require acid to be absorbed, but calcium citrate tablets and dietary calcium (in milk and cheese) do not. In post-menopausal women with osteoporosis this might be something to consider; suggesting that they get their calcium from their diet, instead of pills. Fosamax/Alendronate a commonly used medication in individuals with osteoporosis is not as effective in preventing hip fractures when the individual is taking a PPI. In individuals whose symptoms are not well controlled, other things need to be considered such as the possibility that the individual is not taking their medications regularly or correctly and that the diagnosis is correct. Before surgery is considered, individuals will undergo a 24 hour pH Study and Esophageal Manometry (see above). In individuals who have surgery the most common surgery is a Nissan Fundoplication (see Figure). This involves wrapping the upper part of the stomach around the lower end of the esophagus, increasing the barrier to acid refluxing into the esophagus. In over 90% of individuals, surgery is initially effective, however over time this will loosen up and the individual will need to go back on medication. Esophageal Stricture: In cases of severe acid reflux, chronic exposure to acid can cause the esophagus to ‘scar down’ causing the circumference or the diameter of the esophagus to decrease in size. When this occurs the individual will have trouble swallowing solid foods. Sometimes food can get temporarily ‘hung up’ or sometimes ‘stuck’. When this occurs it is important to see your doctor and have a gastroscopy to confirm the diagnosis and make sure that a cancer has not developed. At the time of the gastroscopy the narrowed part of the esophagus can be opened up. Once the esophagus has been opened up it is important to control the acid with medication. If the individual does not take medication regularly the esophagus will usually scar down and the problems with swallowing will reoccur. Esophageal Cancer: There is an increased incidence of Cancer of the Esophagus in individuals who suffer from chronic Acid Reflux. This usually occurs in individuals who have Barrett’s Esophagus. Barrett’s Esophagus occurs in about 10% of individuals who have chronic acid reflux, and is thought to be due to repeated damage to the lining of the esophagus from the acid reflux. If someone has Barrett’s Esophagus, about 0.5 - 1% per year will develop cancer in this area. If someone does not have Barrett’s Esophagus this is not an issue. Barrett’s Esophagus is diagnosed by doing an endoscopy or gastroscopy. If there is an appearance that brings up this possibility, biopsies are required to confirm the diagnosis. If an individual has Barrett’s Esophagus, their lifetime chance of dying from cancer of the esophagus is increased, and they will usually undergo regular surveillance of this area. The frequency is usually decided upon in discussion with their Gastroenterologist.